A supernova remnant is created when a massive star runs out of fuel and explodes with an expanding debris field. Astronomers have found a supernova remnant that is sweeping up material weighing about 45 times the mass of the Sun as it expands. 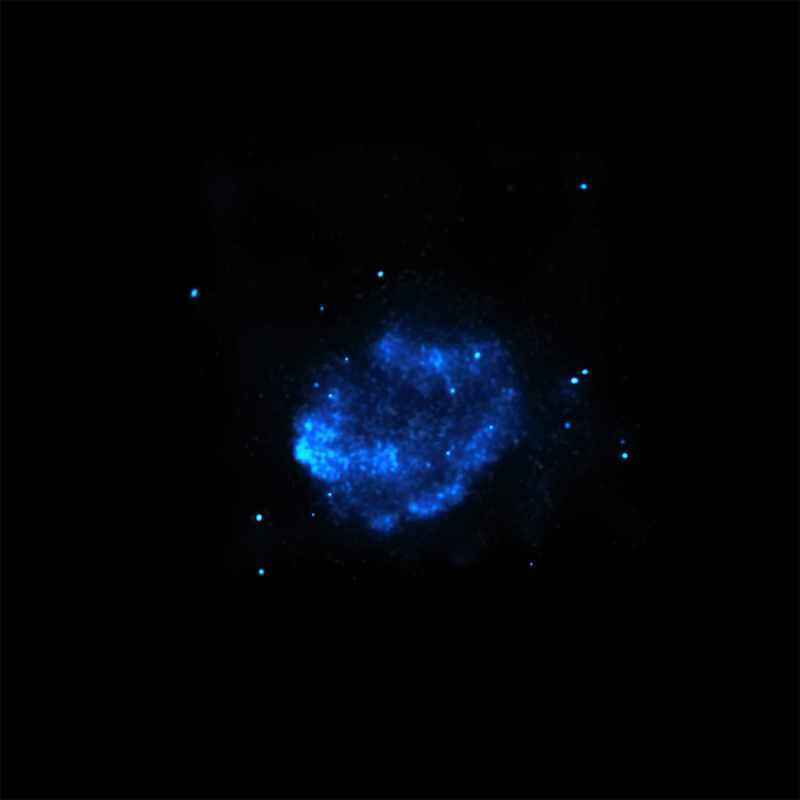 The supernova remnant is called G352.7-0.1 and is located about 24,000 light years from Earth. A new composite image shows G352.7-0.1 in X-rays, radio, infrared, and optical data. Supernovas are the spectacular ends to the lives of many massive stars. These explosions, which occur on average twice a century in the Milky Way, can produce enormous amounts of energy and be as bright as an entire galaxy. These events are also important because the remains of the shattered star are hurled into space. As this debris field - called a supernova remnant - expands, it carries the material it encounters along with it. A recent study suggests that, surprisingly, the X-ray emission in G352 is dominated by the hotter (about 30 million degrees Celsius) debris from the explosion, rather than cooler (about 2 million degrees) emission from surrounding material that has been swept up by the expanding shock wave. This is curious because astronomers estimate that G352 exploded about 2,200 years ago, and supernova remnants of this age usually produce X-rays that are dominated by swept-up material. Scientists are still trying to come up with an explanation for this behavior. 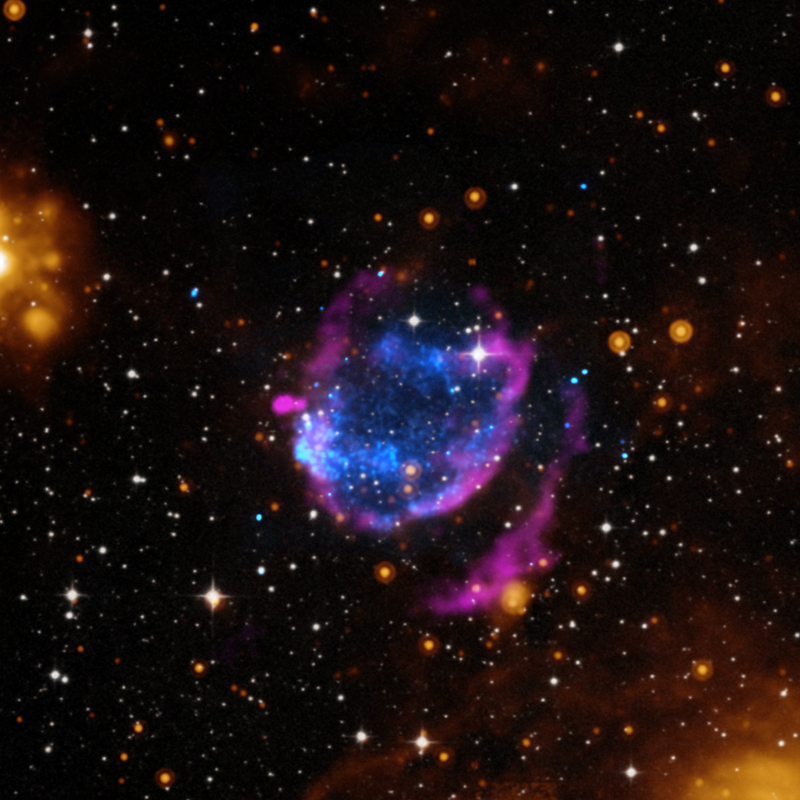 Astronomers also conducted a search for a neutron star that may have been produced by the supernova explosion. They did not find any hints of a neutron star in G352, another astronomical puzzle involved with this system. One possibility is simply that the neutron star is too faint to be detected or that the supernova created a black hole instead. G352 is found about 24,000 light years from Earth in the Milky Way galaxy. A paper describing these enigmatic results was published in the February 20th, 2014 issue of The Astrophysical Journal, and is available online. The first author of this paper is Thomas Pannuti from Morehead State University in Morehead, Kentucky, with co-authors Oleg Kargaltsev (George Washington University), Jared Napier (Morehead State), and Derek Brehm (George Washington). Coordinates (J2000) RA 17h 27m 41.00s | Dec -35° 06´ 45.00"
Was the original phenomenon observed 2,200 years ago? What is the curious bubble of radio signals on the left middle of the image? It doesn't seem to emanate from any of the X-ray objects in the field. Highly impressed by the recent phenomena of your spacial investigations. So in other words a black hole is closer then assumed. wow I love NASA. Any clue as to what the bright light I saw glow then fade was on the night of April 10, 2014 It was towards the western sky at about 11 49 pm CST. About 24,500 light years Earth. Combining X-rays from Chandra, radio data from the Karl G. Jansky Very Large Array, infrared data from Spitzer with optical data from the Digitized Sky Survey. About 1,000 light years across. X-rays are blue, radio pink, infrared orange and optical white.